Covadonga is a paid advertiser of the Kaplowitz blog. This sample is courtesy of Mr. Rolando Reyes, brand owner. Neither of these facts shall have bearing on the findings herein. Big. Oily hand-feel more so than look. Some nice tooth. Big. I was talking to Ron Jeremy this morning about cigars. That makes this all so appropriately inappropriate. Big. As I twirl the thing in my mitt, both oils (visual catches up with hand) and tooth seem to rise. To get revved up, if ya will. Complexion is not even, but of the same shade. Hershey Kiss to Full City coffee bean. Marbling is slight and in trace places, and more a collection of the darker hue. No under-tone to speak of. Veins a minimal with perfectly zilch of an impediment to burn foreseen. Seams are tight sans one slight center 1/3 odd tick that seams to have been cut oddly. Cap has a nice long shoulder under it and itself is well-affixed. Foot tobacco peeks out from there at a mainly monochromatic dark auburn sans any redness. Eyeballs to a medium+ density of packing. Hand-feel is a slick tooth. Good balance for this sized format. Cap is a tick softer than rest of the Charmin squeeze. Rest being an even medium+ with a very good spring-back off the pinching. The 60RG feels more fun here than hampering. There's a good amount of heft to this Covadonga offering, by the by. Schnozzing the shaft, I get a sunny dirt and hay with some mixed pale nuts. The foot is a full-on blitz of cedar -- sweet and creamy with a red hue'd kick. I then proceed, gentlepersons, to employ my Xikar Xi2, which handles well the girth. Medium resistance on the draw, if that much. Almost open. A couple subsequent cold ones firm it up to a definite medium, medium. Very creamy sweet cedar. Some white pepper under that. Lips get some salt. A floral honey is light on my palate and then some salt goes there, too. Kinda interesting. Toasting the foot takes a tick of a bit given the RG, but nothing that speaks to issue, and I'm outside with a Djeep. Hardwood shavings and hay, very lightly so. Not an extravagant toasting aroma, this. First hot draw is some white pepper finding that floral honey in a nice balance. Good cedar stuffs alongside a more generic hardwood. Tongue has a nice tingle. Second hottie is retro-haled to a red pepper addition which fades to a sweet vanilla laced earth note. Under that lies a hay backing. Third hottie is a neat mix of sweetnesses and peppers with an earth core on hay under-belly. Pale nuts return and meet salt, roast lightly. Burn is a bit off, but nowheres near fercockt nor requiring a re-touch, even. I do give it a lick of Djeep quite pre-emptively. Because pretty is good, and I never grade the first touch-up, as it is on the house. Line itself is thin, ash is pale grey with silver-tone areas. Pack softened a half-tick off burn, about a half inch down. Draw is a steady medium tension. Smoke out-put both off foot and into smoke-hole is a goodly satiating medium+. Room-note is a tobacco spice rack with a slight fruitiness. Nutmeg comes in and a bit of lemon rind, as well. Retro-hale exhibits each and peppers. Nutmeg is on the draw, as well. Vanilla steps up a notch; a nice toasted note of it. A leathery note flows in. We're still being introduced, standing around a table and exchanging pleasantries. Profile is a classic medium nicety. Strength has moved the dial but ever so barely, say light+. The burn is having issue finding even and the ash lilts a bit. Lots of silver in the burnt first < inch. Some medium grey at the other end of its spectrum. Mainly it's a light grey. Packing has already recovered and re-firmed. Creamy sweet cedar is now up-top in the primary alongside a red and white pepper mix. Nice balance. The middlings are earth-driven and show lemon zest, nutmeg, vanilla, lightly roasted peanuts, salt, and a far beneath honey which occasionally soars. Under-belly is a tanned leather. Strength is up to a -medium, but knocked on he door first. With that, a new graham note has been intro'd. Good, verily, flavor array -- sans complexity. Straight-forward, but not menacingly or boringly so. Moisture on the tingly mouth-feel is perfect. I just wish the burn would even some, but 60RG and all. Notes to construction/combustion are unchanged. At the end of the opening act, well into cruise control, I roll off the ash in its grown entirety and retouch the top-leaf. Ash is quite dense and oily in my $0.99 Walmart plastic tray. Burn-line seems to even some. 30 minute 1/3. A bit fast, perhaps, but nothing odd. Nice. Quite salty now. Sweet and sunny hay comes back and flits about the middling. Line is not even, but better and not an issue now. Ash pales moreso. Pace of burn picks up. Flavors are unchanged and I ain't complaining. 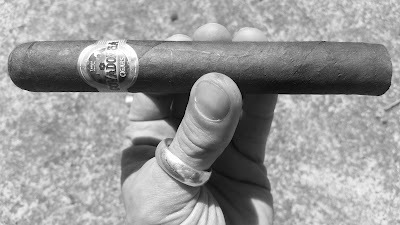 When I have smoked Covadonga in the past, it has always been fun. This Grande Maduro is no different, gentlepersons. It begs loud company. A set of dominoes, a cup of coffee with cream and sugar... did I just talk myself into tasting a medium roast sip of coffee? Mayhaps, but I does indeed. Pack softens again. Seams loosen a tick whenst I doth pinch. Draw and output are Samesville, Daddy-O. Retro-hale has come down in the red pepper some, and it sweetens the profile a bit. Still a nice tingle on the palate of peppers and salt. My lips have some clarified butter on 'em. Lettuce call the burn even. I'm smiling, I am. I do believe cigars have a soul. Perhaps it's the soul remnants of hands along the way. Cova got soul. A happy one... an earned happy one. Smoke ramps up and billows in a white cumulus manner all around me. Strength and profile are medium. Profile may be pushing a medium+. Shaft gets oily and so does my yap. Medium+ profile. A creamery butter is upon me. I notice that the shorter the stick gets, the wider it feels in my smoke-hole. Maybe it's just from having it dangling in there for a while now. I started this, the final act, as I started the previous. This time lighter re-touch after rolling off the collected ash. Ash is the same -- perhaps a tick more toothy. No transition, but I was not expecting one. Flavors remain delineated and a bit sweeter, still braced by a nice tingle. Retro-hale has a black pepper in it now. Not much left of the white. I've always wanted to move to Detroit. What? Red pepper is at the back of my throat, but not at all roughly. Peanuts seem darker and roasted more heavily. Coffee is heavier, as well. Somewhat of a darker profile. Honey comes up. Cedar muscles. Really nada has fallen off, note-wise. Some toast more than others, mainly the sweet ones. Cream, particularly. Combustion has improved. Construction has softened again, but seams are tighter. Draw is still same as ever, as is the result. Shaft feels a bit dry now, but mouth-feel does not reflect that. There is a greater tingle there, though. I'm getting a Cracker Jack vibe -- caramelized sugar. Burn-line is thin+ and even. Room-note is hardwoodsier. I thought that maybe the hardwood note maybe fell off a bit ago... but it's still in the near under-belly of the middling, if you look. Burn has slowed much, now. Profile tease up toward a -full. A jovial man with suddenly something of importance to convey. "Don't take any wooden nickels." He says. Slaps me on the back, laughs. Sits next to me silently. We are silent. He's been through a lot, I take it. Old. So have I, gentlepersons. No spring chicken. Alone and together, there we are. Solemn, with a chance of sudden dance. Company, first loud, than quiet. Coffee. Maybe even sweet tea on ice, in the sun. Could you grade a feeling? My allergy medicine wears thin. I was serious about Detroit. More seriousness? Sometimes a cigar meditation makes me happy-cry. Less seriousness? What vitola would suit a Ron Jeremy private label offering? The mother tells her newlywed daughter to stay there -- SHE will go upstairs, instead, to see the newlywed hubby. The joke is funnier with its set-up. Why are you laughing?